Always popular, always magical. Join us for Breakfast with Santa this weekend. Saturday’s first session is completely sold out but there are very limited spaces available for Saturday at 10am and Sunday. Book now to avoid missing out. An amazing response to Santa’s Grotto this year – and why not as his helpers have really pulled out all the stops for a grotto that is bigger, better and more beautiful than ever before. There is no online booking for Santa’s Grotto – and he will see every child that will wait for him. There’s lots of free activities for kids whilst they queue. Santa’s Grotto is open 11:15am to 4pm Saturday and Sunday. Each special child will receive a premium toy. Accompanying adults enjoy free entry. Saturday’s Afternoon Tea with Elsa is now completely sold out. There are very limited spaces available for Saturday 16th. Book now to avoid missing out. There’s fab food in our Canalside restaurant with all day breakfasts available …er all day and Sunday sees our delicious Sunday Lunch. Lighter bites are available too and did we mention cake?! There’s savings on Christmas cards, decorations and wrap – THREE for TWO on most lines and we have fantastic prices on both real and artificial trees – with sparkling deals on lights to go on them too!! Don’t forget your pets – it’s Christmas for them too. We are pet friendly and even love to welcome your (behaved) pets on the site. We have a huge selection of tasty treats for those with paws or claws. Frosty our fifty-foot-of-fab-fun inflatable snowman will be available for good boys and girls. …and finally some of the best Christmas displays for miles around. The lights, the colour, the sounds and the fun of Christmas THIS WEEKEND. 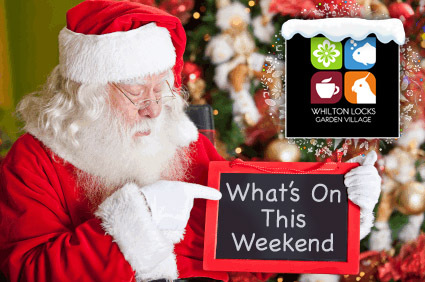 Ho ho ho-nly at Whilton Locks Winter Wonderland.